You will not find this book in a bookstore near you. 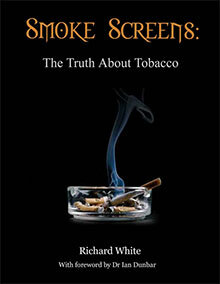 “Smoke Screens, the truth about tobacco” by Richard White. If you are a smoker and don’t plan to quit: Read this book. Your cigarette will taste even better and your loss of bad conscience will make you live longer. If you are a smoker and want to quit: Don’t read this book. It may convince you not to - and then make you live longer too. If you are a non-smoker (not very probable since you are reading this) only read if you are open-minded and have the guts to face new facts. The facts presented in this book are new to me - they have been hidden from public consumption since the start of the cold war - when I was born. Why are these facts hidden from us? This does not mean, of course, that the facts presented in Smoke Screens constitute the whole truth and nothing but the truth. But it does speak against the Official Truth and it should open for an overdue needed discussion. I must admit, I still have difficulties to believe that smoking doesn’t lead to lung cancer and CODP, but it makes me wonder (hope). This makes the proponents for a ban on passive smoking look like ludicrous liers. Their crusade is not based on what we know, only what they believe. And what they believe has now sadly become the Official Truth. This is not about health, this is about politics, money and morality. So let us treat it like that. You may not like nicotin or smokers, but ban them? You may not like alcohol and drinkers, but ban them? And even if smokers and drinkers hurt themselves, that should be their own responsibility?